Let’s talk Mash. Monster Mash. No, not that hideous lumpy stuff that gets stuck in your throat and is served up by sweltering school canteens but the latest phenomenon to hit the book shelves - Monster Mash. So what exactly is Mash in literary terms? Well, to go back to the potato analogy it’s rather like mixing up two genres as you would mash up your potato with butter. Hopefully, the result is something pretty tasty. However, unlike the best mash potato which is creamy and luxurious there’s always a chance it might turn out like school mash and leave you a tad queasy. This latest trend of monster mashing is not just a mixture of genres but, more specifically, the concept of combining a classic novel with the horror genre. This is done, supposedly, in the pursuit of comedy and the way has been led by Pride and Prejudice and Zombies by the American author Seth Grahame-Smith. Originally the publishers, Quirk Books, expected the novel to do nothing more than break even. However, after it was picked up by the blogosphere and word spread of the Bennet sisters’ sudden conversion to mass murder Pride and Prejudice and Zombies rocketed into the New York Times best seller list and, as of July, it has now sold over 600,000 copies in the US and over 50,000 in the UK. But just how successful is Pride and Prejudice and Zombies as a comedy? Well, it is what I would call “moderately successful.” In the earlier chapters of the book I laughed out loud at the idea of a Regency England stricken by crazed zombies and the virginal Bennet sisters as zombie slaying marshal arts experts. I find myself very unwell this morning, which I suppose, is to be imputed to my being set upon by several freshly unearthed unmentionables during my ride to Netherfield. My kind friends will not hear of my returning till I am better. They insist on my seeing Mr. Jones – therefore do not be alarmed if you should hear of his having been to me- and excepting a few bruises and a minor stab wound, there is not much the matter with me. So yes, there is humour in adding the living dead to Pride and Prejudice. But unfortunately, it’s just not a gag you can sustain for 300 pages. Sadly, by the latter stages of the book I was thoroughly bored. In fact, to be honest, I sick to death of hearing about dojos, daggers and "unmentionables." I was beginning to wonder when or if ever, Seth Grahame-Smith was going to turn up the humour stakes. After all, a good joke (especially a long one) needs a powerful punch line. Unfortunately, no last minute comedy feast materialized and instead of ending with a bang this Regency meets Gothic comedy ended with barely a whimper. Our responsibility to Austen was to stay true to her original plotline. The book is about 85% of Austen’s original text and 15% zombies. To be honest, Quirk wasn’t sure how the public would react to adding zombies to one of Austen’s most beloved works. There have definitely been criticisms to what we have done, but it seems most people truly do enjoy the zombie mayhem—and on a global scale. Oh come on Jason! What a pile of poo! In my humble opinion, having added blood, guts and zombies to one of the most popular classics of all time Quirk Books pretty much negated the responsibility to preserve it in any way, shape or form. 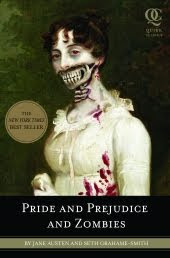 And I hardly think that anyone who has read Pride and Prejudice and Zombies because of an attraction to the zombie element alone is likely to read Austen’s entire original works! I could be wrong but I think if you’ve butchered a classic you might as well go all out for the comedy element - otherwise you’re left with a comedy of errors in the truest sense of the phrase. Now don't misunderstand me; Pride and Prejudice and Zombies is entertaining. However, I felt that with some serious editing of the original text and further elaboration on the zombie elements it could have been more than just mildly amusing. Possibly hilarious. Let’s be realistic - even the most devout Austen fan is not going to remember every page word for word, so why worry about sticking to the intricacies of the text and plot? So long as Darcy and Elizabeth ended up together who would have cared if the rest of the entire cast were slaughtered beyond recognition? I, for one, would love to have seen Mrs Bennet strung up by her pantaloons and what would be better than cutting out Lydia’s tongue and burying her alive? And as for that lackadaisical Mr Bennet a hot poker up the backside would have been a just reward for letting his youngest daughter turn out a right trollop. Perhaps there’s also another reason why Pride and Prejudice and Zombies didn’t work for me – and that’s because it’s written by an American. Pride and Prejudice is so quintessentially English it’s a shame that the novel didn’t really take full advantage of the humour that is to be found in just being English. I was slightly annoyed with the constant referrals to the Bennet sisters’ martial arts training in Japan and the repeated high kicks and punches. What happened to fencing with umbrellas, cucumbers and shooting sticks? What about duels with custard pies and jellies at dawn? Maybe that’s something only someone who truly understands Englishness can convey? I’m not entirely sure - and I know there will be those who will disagree. However, I guess if the author was going to be American I’d probably have chosen someone like Bill Bryson. So there you have it. Another novel I’ve lambasted. Oh well, someone’s gotta do it! Now the good news is (depending on whether or not you like your mash) a whole host of Monster Mash will shortly be arriving on your book shelves including Queen Victoria; Demon Hunter, I am Scrooge; A Zombie Story for Christmas, Pinocchio; Vampire Slayer, Abraham Lincoln; Vampire Hunter (by Seth Grahame-Smith) and in September the Austen sequel from Quirk books Sense and Sensibility and Sea Monsters by Ben Winters. I’m just hoping that when I read Quirk's latest offering the only gagging I’ll be doing is from laughter and not some indigestible half baked potato. You make a good point, Jane, noting that Jane Austen would not write about tai kwando. Oscar Wilde's quote,"We have really everything in common with America nowadays except, of course, language," is funny because language differences may be the least cultural difference. Still, research can do wonders. One has to wonder how closely the writers even read "Pride and Prejudice." Loved this, Jane, and thanks for bringing Mashing to my attention. I hadn't heard of it before, but from what you have said, it sounds a very risky project for anyone to take on. It seems like it will either work or not. Humour, whether tongue-in-cheek or full belly, is hard to pull off at the best of times. I'll give this one a miss, and maybe watch from a distance for now. I've been attracted to this book ever since I saw its cover. Think it's fabulous. Your review worked superbly for me in terms of exploring that balance between keeping flavours of the original and taking it in a new direction for the sake of humour - and how you felt the humour may have been more effectively developed. I saw this title at Borders Books today and I read snippets of it. It definitely is creative and seems funny. One day I may read it, but I cannot jusify doing so now with my current reading list. Thanks for turning me on to the book, and the genre. -Mike. Yes, a valuable point you make about research - in fact I would say that during my background research to this post I got the impression that SGS just leapt into the project. I guess since he already had his "novel" it must have been a huge temptation just to launch right in and start tweaking the text. But yes, you're right- research work wonders and since the best humour comes from knowing your subject really well perhaps a little more research might have made all the difference to P&P&Z. Glad you enjoyed this article. I really like the concept of Mashing -in fact unconciously (before I knew of the term myself) I'd tried doing it myself. I think there's a huge amount of potential humour in this genre - which is obviously why so many publishers are leaping on the bandwagon. I'll definately be reading Sense and Sensibility with Seamonsters though to see if there has been an improvement - although since it is out so quickly after P&P&Z in may be just a case of cashing in on a smash hit before the interest wanes. When I read P&P&Z I was reminded of when I saw The Reduced Shakespeare Company perform The Bible in about 2 hours. It was hilarious! Now The Bible is universal reading/viewing matter but nevertheless it was apparent that those who had genuinely read it or perhaps been brought up in a religous household probably found it more entertaining. Maybe that's why the best stand up comedians always talk about mundane everyday subjects which we can all appreciate. Sounds like you have an impressive reading list- I have the same problem myself - I just hope my "waiting to read" book shelf doesn't fall on my head - otherwise I could be in serious trouble!